Are you in with the latest game Pokemon Go? Here’s a good reason to try playing Pokemon go using Globe and TM (Touch Mobile) SIM. You can get free internet access for when use the Pokemon Go app even if you don’t have balance on your prepaid account. Do you want to try it now? Just check out below on how you can avail this promo. Downloading the Pokemon Go and Switch app requires you to use data. This is not included on this promo offer by Globe and TM. You can register to any internet promo before you can download these two apps on Play Store and iOS App store. Do note that Globe Switch is not yet available for IoS device users. You also have app an option if you don’t want to register an internet promo on Globe and TM, if you have a Shareit app you can ask your friend to send the 2 application directly to your phone. Turn on your mobile data, by going to Settings or swiping down the shortcut on top of your phone screen. Open Globe Switch app, complete the screen prompt until you reach Switch home screen. Look and expand Hot Deals menu, you will see list of applications you can access for free. Locate the Pokemon Go app. Click the FREE button beside Pokemon Go icon. You will be prompted to accept the promo offer after reading the summary. Accept to send request to activation of free Pokemon Go Access. Once successful, you will be notified on screen that your free offer is now activated and ready to use. 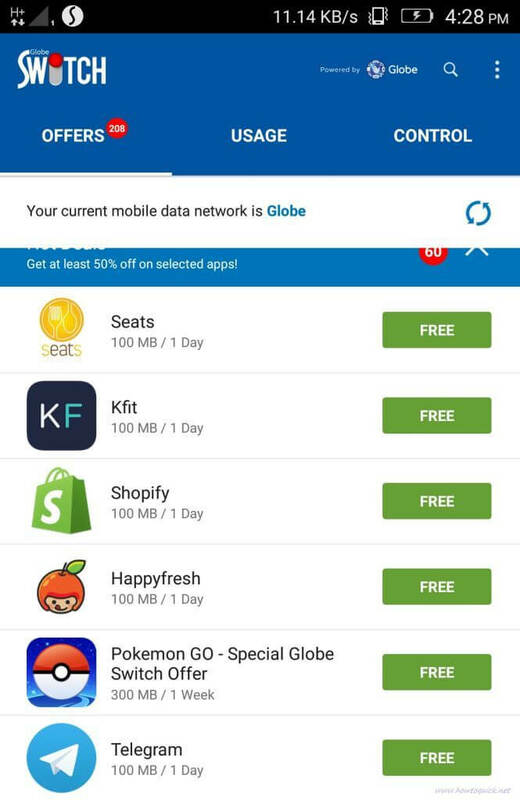 Note: This promo lets you enjoy free Pokemon Go access for 7 days / 1 week (300MB) without data charges or even if you have zero balance on your Globe and TM account. 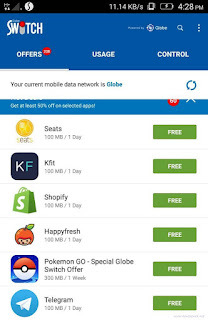 That’s it, if you want to know more about Globe Switch free application internet access offer check out our post on How to Use Globe and TM Switch app to access free internet. I have already install that switch ups but my pokemon go will notify that "GSPS not found"